What a wonderful time to be thinking of those young garden lovers on your holiday list. 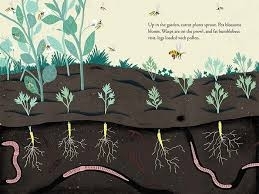 I can't think of a more perfect book to recommend for gift giving than “Up in the Garden & Down in the Dirt”. Award-winning author, Kate Messner, (“Over and Under the Snow”)—along with illustrator Christopher Silas Neal, has written a most engaging book for young children—ages 4-8. It is well researched and presented in an exuberant and lyrical form. The characters, a grandma and her grand daughter, beckon the reader to discover the wonders that lie above the soil—hidden between corn stalks and under the leaves which provide welcome shade. And then, we learn about the counterpart to all of that lush growth—down deep in the “dirt”. Here we can explore the hidden world and varied lives of the garden throughout all of the seasons of the year. 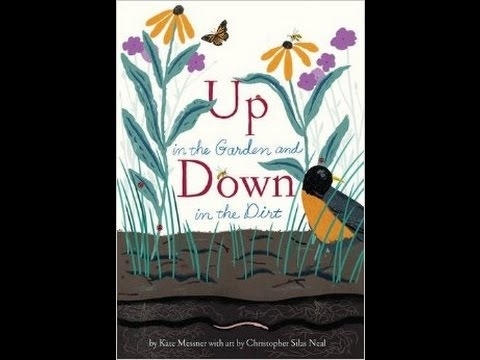 Messner and Neal draw dramatic contrasts between “up in the garden”-- with a world full of green, sprouting, lush vegetables, fruits and flowers—and “down in the busy dirt”, where so much of the work is really done. We meet worms, snakes, skunks, and insects—digging, hunting, burrowing and thriving. And, if you want a great review of garden “beneficials”—this is the book for you! The joyful text is complemented by gorgeous, full page and vivid color illustrations. And, Messner, a true educator, provides a wonderful glossary together with an excellent after-word. Even the front-piece pages have delightful sketches of garden veggies, herbs, and flowers, all identified for the curious reader. This is a book to give and to share. Even the most gifted of gardeners will enjoy this joyful read. What a wonderful review of a book that looks charming, Lanie! I’m going to get a copy for my grandchildren and me to read together.